Cooley Francenia Araline Cooley(1854-1923) of Bath, Grafton County, New Hampshire; Manchester, Delaware County, Iowa; South Dakota; and North Dakota. Crume John William Crume (1849-1909) of Wabash County, Indiana; Blue Earth County, Minnesota; and Moorhead, Clay County, Minnesota. Grant Alva Anson Grant (1856-1920) of Houlton, Aroostook County, Maine; New Brunswick, Canada; and Riverton Township, Clay County, Minnesota. Hall Lura May Alvira (Hall) (Crume) Hoppe (1874-1949) of Rice County, Minnesota; Moorhead, Clay County, Minnesota; Toledo, Lucas County, Ohio; Cass County, North Dakota; and Opportunity, Spokane County, Washington. Morgan Thomas William Morgan (1854-1924) of Athens, Bradford, County, Pennsylvania; Manchester, Delaware County, Iowa; South Dakota; and North Dakota. Olmsted Stephen Armstrong Olmsted (1846-1931) of Davenport, Delaware County, New York; Victoria, Knox County, Illinois; and Dickey County, North Dakota. Pennington Julia Mina (Pennington) Grant (1862-1921) of Houlton, Aroostook County, Maine and Riverton Township, Clay County, Minnesota. Robertson Elizabeth Lucy (Robertson) Olmsted (1859-1945) of South Worcester, Otsego County, New York; Victoria, Knox County, Illinois; Dickey County, North Dakota; and Rockwell Township, Norman County, Minnesota. Adams Stephen ADAMS (1746-1819) of Hamilton, Essex County, Massachusetts; Moultonborough, Strafford County (now Carroll County) New Hampshire; and Meredith, Strafford County (now Belknap County), New Hampshire; and his wives Sarah BENNETT and Jane BOND (baptized 1757, Exeter, Rockingham County, New Hampshire). Surnames include COOLEY, FRENCH, MORGAN, MUCKLER and SNOW. Descendants lived in New Hampshire, Iowa, South Dakota and elsewhere. Chafee Julius Bacchus CHAFEE (1805-1889) and his wife Minerva RUGGLES of Colesville and Windsor, Broome County, New York. Their descendants lived in New York, Pennsylvania, Iowa, South Dakota and North Dakota. Surnames include CROFUT, MORGAN, SALISBURY and SHEPPARD. Collier Stephen Collier / Stephen Collar / Stephen Coller of New Hartford, Litchfield County, Connecticut. Crum Henry Cram / Crum / Crumb of Philadelphia, Pennsylvania; St. Mark's Parish, Orange County, Virginia and Frederick County, Virginia. Crume Philip CRUME (1724-1801) of Virginia and Kentucky and his wives Sarah WITHERS and Anna BARRETT. Surnames include BIRKHEAD, BURKHEAD, DEEM, KERCHIVAL, KLINGLESMITH, LUCAS, MARKS and SCIFRES. Descendants lived in Ohio, Indiana and elsewhere. Evans Edward Evans and his wife Jennet who lived in Plainfield, Windham County, Connecticut, between 1723 and 1752. Ferguson David Ferguson who was married in 1755 at Port of Menteith, Perth, Scotland, to Elizabeth McQueen. Their descendants lived in Kilmadock, Perthshire, Scotland; Cambridge, Washington County, New York; and Kortright, Delaware County, New York. Surnames include HALL, KELSO, MCMINN and ROBERTSON. Fraser James FRASER who was born in 1800 in Inverness, Inverness-shire, Scotland, and died in 1878 in Bogotá, Colombia, South America, and his wife Maria Petra VERGARA. Surnames include OTERO and HARRIS. French John FRENCH who died in 1795 at Pittsfield, Berkshire County, Massachusetts, and his wife Anna (MORRIS?). Gallop Nathaniel GALLOP (born about 1735, died after 1776), a Loyalist of Massachusetts, Nova Scotia and New Brunswick, and his wife Hannah (PARENT?). Surnames include BURPEE, FARLEY, GALLUPE, JEWETT, PENNINGTON and PHILLIPS. Descendants lived in Aroostook County, Maine, and elsewhere. Grant George GRANT of Dublin, Ireland, who died before 1791, and his wife Patience HOBART through their son Samuel GRANT (baptized 1760), a Loyalist of York County, New Brunswick. Surnames include HOVEY and LONDON. Descendants lived in Aroostook County, Maine, and elsewhere. Green George GREEN (born 1731) of Greenwood Township, Mifflin County (now Juniata County), Pennsylvania and his wife Sarah. Hall Jonathan Hall (1754-1805) of Cheshire, New Haven County, Connecticut, and New Hartford, Litchfield County, Connecticut. Descendants lived in New York, Pennsylvania, Minnesota and California. Hoag Daniel H. HOAG (1772-1848) of New York and Wisconsin and his wives Margaret BAKER and Sophia WHITE. Surnames include CAMPBELL, CLARK, CRUME, MAGEE, NEWTON and REISDORPH. Descendants lived in Pennsylvania, Minnesota and elsewhere. Hooper Nathaniel HOOPER who was born in 1734 in Bridgewater, Plymouth County, Massachusetts. Surnames include BURLINGHAME, CHANDLER and HOAG. Descendants lived in New York, Pennsylvania and elsewhere. Jones Samuel JONES (1765-1805) of Talgarth and Llanigon, Breconshire, Wales, and his wife Ann/Anna POWELL (1767-1852) of Glasbury and Llanigon, Breconshire, Wales, and Philadelphia, Pennsylvania. Surnames include BELLINGHAM, CLAPP, FRITCHER, FUREY, GRUBB, HINDS, HOPPER, KIMMAL, MCGIFFIN, MORGAN, PARRY, PEARSON, PIERSON, RUGGLES, RULE, SHEPPARD, SMITH, WARREN and WHITLOCK. Descendants lived in Arkansas, Illinois, Iowa, Kansas, Oklahoma, Pennsylvania, South Dakota and elsewhere. Jones Charles Jones headed one of the five families from Philadelphia who settled in Moncton, New Brunswick, in 1766. McMorris Armstrong MCMORRIS (about 1738-1823) of (Magherabeg, Dromore, County Down?) Ireland and Kortright, Delaware County, New York, and his wife Mary MCCRAY (about 1748-1843). Surnames include OLMSTED and OVERLANDER. Descendants lived in Washington County, New York; Victoria, Knox County, Illinois; and elsewhere. Morris John MORRIS who was married on 18 May 1782 at Pittsfield, Berkshire County, Massachusetts, to Anna. Myers William Myers (1802-1845) and his wife Lucy (Brown) (Myers) Hummel (1801-1896) of Maryland, Otsego County, New York. Their descendants lived in New York, Pennsylvania, Illinois, South Dakota and North Dakota. Pennington Isaac PENNINGTON of Culmstock, Devon, England. Pennington James PENNINGTON who died in Liverpool, Lancashire, England, in 1737, and his wife Isabel who died in 1725 in Liverpool. Their grandsons James, John and Seth PENNINGTON made pottery and ceramics. Pennington James PENNINGTON, a Loyalist born in England who died in 1808 at Queensbury, York County, New Brunswick, and his wife Mary PRICE (abt. 1772 - 1859). Surnames include ANDERSON, DRAKE, GRANT, HOVEY, JOHNSTON, JONES, KIMBALL, KINNEY and MCKEEN. Descendants lived in Aroostook County, Maine; and Minnesota. Pennington John PENNINGTON who was born in about 1803 in Liverpool, Lancashire, England, and died in 1880 at Petitcodiac, Westmorland County, New Brunswick. Was he related to the Loyalist James PENNINGTON who died in Queensbury Parish, York County, New Brunswick in 1808? Surnames include MORTON and ROBERTSON. Pennington William PENNINGTON and Elizabeth COLLINGS who were married 19 Sept. 1743 at Culmstock, Devon, England. Price Edmund PRICE died in 1786 at the Mistake, Kings County, New Brunswick, and his wife Jane WEBB died after 1815 when she was living at New Canaan, Queens County, New Brunswick. Reno The siblings Peter, Francis and Jane Renau / Reno / Renno / Renow of Germany; Philadelphia, Pennsylvania; and Dutchess County, New York. Robertson Edward ROBERTSON of Ardchoill Parish (four miles southwest of Killin, Perthshire, Scotland) who was married in 1780 to Mary MCGRIGOR (baptized in 1755 at St. Ninians, Stirling, Scotland). They emigrated to New York in 1804 and probably settled at Middleburgh, Schoharie County. Surnames include CHRISTIE, CORNISH, CROWE, FEAK, MURPHY and OLMSTED. Descendants lived in South Worcester, Otsego County, New York; Illinois, Minnesota and elsewhere. Schaubhut Tobias SCHAUBHUT (1762-1803) of Germany and Pennsylvania and his wife Maria. Surnames include BANKS, BECKER, CRUME, DITTON, GABLE, GRICE, KEISER, LOGAN, RICKERT, SAMBORN, SHAUBHUT, SHAUBUT, SIGNS, WAMPLER and WATSON. Descendants lived in Indiana, Minnesota and elsewhere. Slipp Johann Leonhard SCHLOEPP, aka Leonard SLIP / SLIPP (1746 / 1748-1833) of Frankfurt, Franconia, Germany; New York; and New Brunswick, and his wife Elizabeth REISSNER / RYSON / RYERSON / RIEMER (1756 / 1757-1821 / 1827). Surnames include CLARK, CURREY, GOOD, MERRITT, MUSGROVE, PALMER, PETERS and VAN WART. 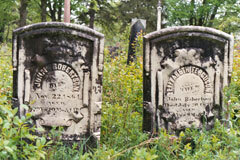 Gravestones of Scottish immigrants, John Robertson (1785-1864) and his wife Elizabeth Ferguson (1789-1871), South Worcester, Otsego County, New York. Click to view a larger version. Photo by Rick Crume, 2005.